The event, held at the Park Hyatt Washington, helped to raise nearly $40,000 to support AMAR’s emergency refugee response and highlight the fight to combat violence against women in the Middle East. 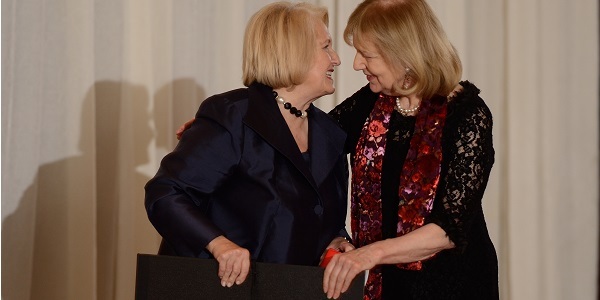 On Thursday October 23, the United States’ first Ambassador for Global Women’s Issues, Melanne Verveer, was the honoree at AMAR’s Second Annual Gala Dinner. The evening raised awareness and funds for AMAR’s pioneering work with the State Department to combat violence against women in Iraq, particularly in light of the ISIS threat. After receiving the AMAR “Helping Humanity Flourish Award from AMAR Chairman Baroness Nicholson of Winterbourne, Ambassador Verveer told guests that it was hard to believe that in the 21st Century the world was witnessing horrors of a magnitude now being seen in Iraq. The Ambassador added that violence against women was a global scourge and must be condemned, noting that “no country can develop if it left half of its people behind. No economy can grow if it excludes women from full economic participation”. The denial of women’s rights and the oppression of women went hand in hand with threats to security and instability. More than 130 guests attended the event, organised by the charity to help support its emergency, medical, educational, and human rights work in Iraq and Lebanon. The keynote speaker was former Nebraska Senator and Governor, The Hon. Bob Kerrey. He praised both the charity’s 23-years of work in Iraq and also the efforts of its Chairman, Baroness Nicholson of Winterbourne. “Thank you Baroness for your courage and being an inspiring human being. You inspire the young and women in what they are trying to do to build a better life,” said Senator Kerrey, who received the Medal of Honor serving as a Navy Seal in Vietnam. Senator Kerrey said the answer to the question; “what can we do?” was a simple one. It was to give money and support to organizations like AMAR. AMAR, which has offices in Washington, London, Baghdad, and Beirut, is currently running an emergency response for the people of Iraq. Their teams on the ground are trying to help as many of the 1.8 million refugees as they can. Winter is fast-approaching and urgent aid is needed now. The event, which featured an auction that included prizes such as a tour of the British Houses of Parliament and Oxford, raised $40,000 for AMAR programs. A follow-on conference on Monday 27 October, ‘Responding to ISIS violence against women and girls‘, brought together senior US government officials, NGO practitioners and academics to highlight ISIS atrocities and discuss practical means for assistance. AMAR would like to thank our generous gala sponsors, NAWAH, ManSat and the Khudairi Group, without whom the event could not have been such a resounding success.